I’ve been really enjoying Project Spectrum this first week. Red isn’t exactly a color I gravitate toward, but the project is certainly making me more mindful of it, so far. Not all my Project Spectrum endeavors are fiber-related; I started a Tumblr as a sort of homebase for my Project Spectrum — although I may end up posting other things there as well, who knows? Remember those two batts I posted two weeks ago? I finally got them skeined and photographed. They’re both composed of the same mix of fibers and colors, but the more homogeneous was carded twice and the yarn with more distinct colors was carded once. 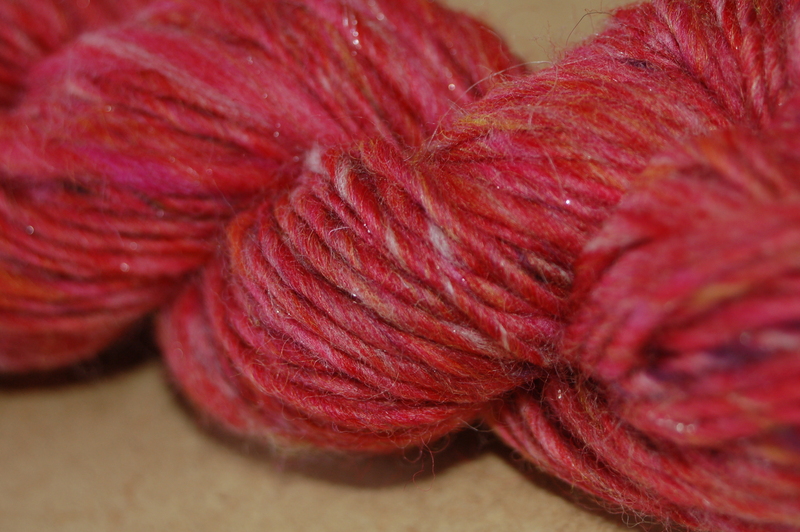 50.2 grams of fiber yielded 114 yards, pre-bath. 55.6 grams of fiber yielded 100 yards of thick and thin, pre-bath. Plying this is on the agenda for today. I think I’ll also be ordering beads today, for my first-ever beaded knitting project, the large-size Aeolian Shawl (Ravelry). I’m looking at these beads, to go with the Jaggerspun Zephyr wool/silk in mahogany I already have. I certainly won’t finish this within the month, but I’m looking forward to the challenge, regardless. Where are you noticing red today? Have you crafted a finished object this week? Check out the roundup of other people’s finished objects for the week at Tami’s Amis. Also, see the Fiber Arts Friday roundup at Wisdom Begins in Wonder to see what other people are crafting this week. This entry was posted in spinning and tagged fiber arts, fiber arts friday, finished object friday, Project Spectrum, yarn. Bookmark the permalink. Wow those look great! I didn’t know there were beading projects for knitting! 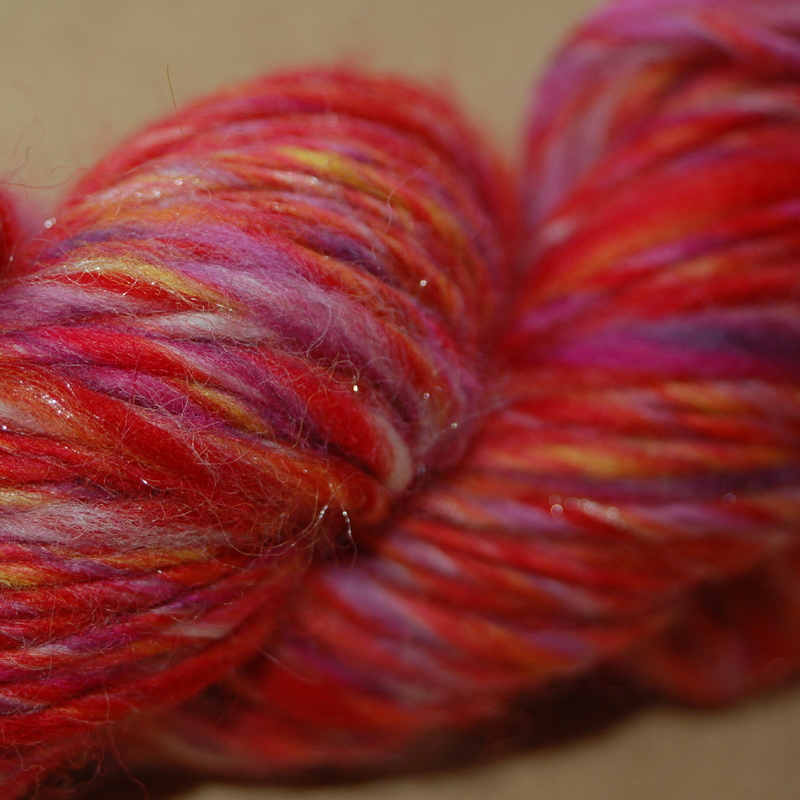 I had a friend who just dyed her yarn herself…she came out with some great results! Yes, dyeing is great fun! Red is my favorite color, so I think that yarn is gorgeous! So pretty and a bit shiny! Love it! This makes me think I really should give dying and spinning a try. The yarn turned out beautiful! I always love your spinning. You’re so good at it! Oh I love both yarns. Your spinning is awesome. I checked out the links you posted for the shawl and I think the beads you’ve chosen will look great with the yarn color you’ve choosen. I do a lot of beading but must admit not with my knitting. Thanks for giving me something to think about for the future. Your two red skeins are gorgeous! I love the texture in both of them. Great job. Where am I seeing red? hmmm, I have a knitted coffee mug cozie a friend made me using my Red Alpaca Yarn that is right in front of my puter here at work. My National Kidney Foundation bag is also red and orange…yes, I love the Reds I’m seeing today. 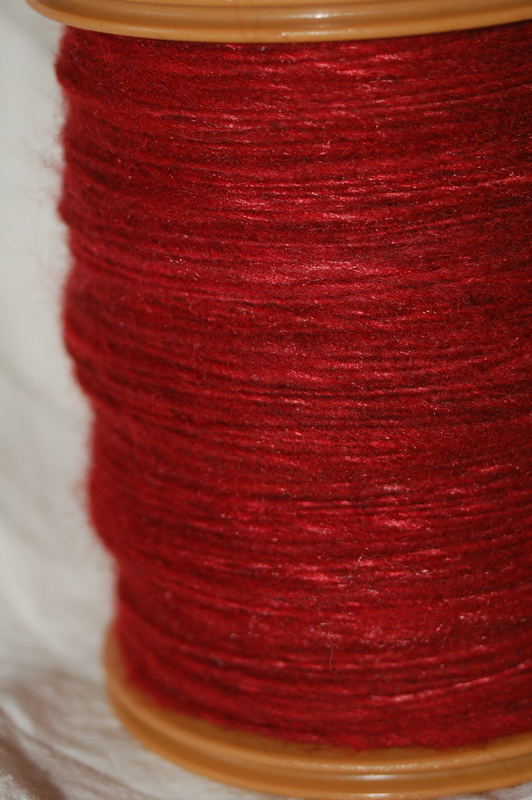 The yarn on the bobbin is gorgeous … I just finished a dark red shawl. I love me some red! Thanks. I haven’t decided what I’m going to make with that yarn yet. Beautiful! Your spinning is just lovely and all that red — mmmmm. Love the red, it looks romantic. What do you plan to make with it? I don’t usually gravitate towards red as a color either, but after seeing your beautiful red yarn I want to run out and get some red fiber. 🙂 It is amazing how much difference another run through the carder can make in the finished product. Both skeins are absolutely gorgeous! I’m really loving the excuse to explore color! Pretty, pretty, pretty! I love that pink/red combination. Your yarn is lovely.